The Church of St John the Evangelist, at Hale, midway between Aldershot in Hants, and Farnham in Surrey, was erected in the year 1844, by public subscription. The late Queen Dowager, who was the first contributor, gave the sum of £25 towards the commencement of the undertaking. A few years after the opening of the Church, Aldershot, from being an obscure hamlet, became a large Garrison town. The effect of this upon the adjoining Parish of Hale, was such, as almost immediately to double the population. At the census of 1861, it was found to have risen from a few hundreds, to nearly 3,000 people; the population is now little less than 4,000, and is still rapidly increasing. With so large a Parish, there is only Church Accommodation for 175 persons; —and besides the regular Parishioners, many Officers and their families are in the habit of attending from Aldershot, and they would do so in greater numbers, could room be found for them. It is therefore proposed to meet the urgent demand for further accommodation, by an addition, of 400 Sittings to the Church, this being the largest increase of which the building is capable. Plans have been drawn out by Benjn. Ferrey, F.S.A. Esq., of Charing Cross, the Architect of the original structure, for the Erection of a North Transept, the Enlargement of the South Aisle, and an Extension of the present very contracted Chancel. 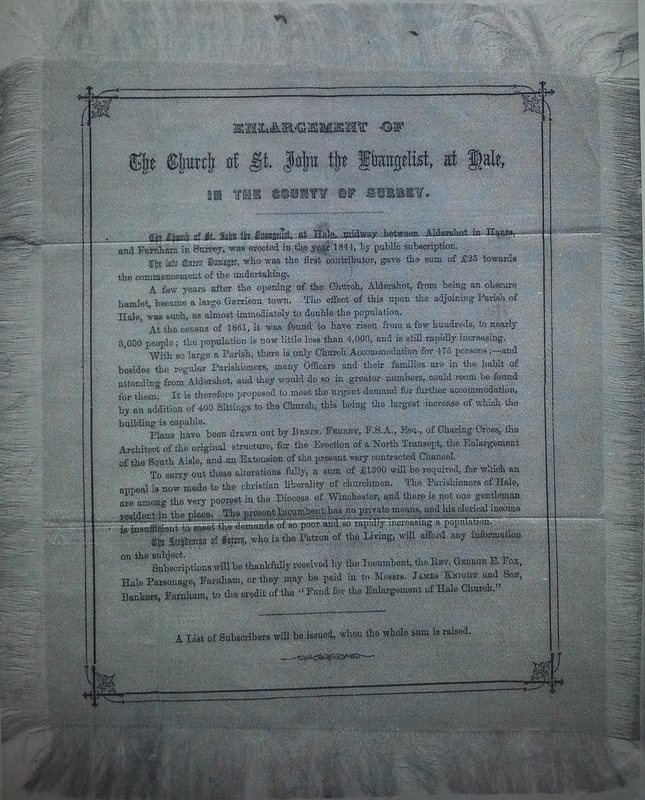 To carry out those alterations fully, a sum of £1300 will be required, for which an appeal is now made to the christian liberality of churchmen. The Parishioners of Hale, are among the very poorest, in the Diocese of Winchester, and there is not one gentleman resident in the place. The present Incumbent has no private means, and his clerical income is insufficient to meet the demands of so poor and so rapidly increasing population. The Archdeacon of Surrey, who is the Patron of the Living, will afford any information on the subject. A list of Subscribers will be issued, when the whole sum is raised. St Mark’s church is in the heart of a populated area, opposite Hale School and surrounded by many families. It is a church that is growing – over the past three years the congregation has doubled and the number of children attending has tripled. In 2011 the numbers were depressing, with an average of ten people dotted around the 200 chapel chairs in a cold and dark church having a traditional communion service with an organ which made horrible whining noises. So the decision was made to change the worship to make it “all-age” every week, the chapel chairs were sold and replaced by comfortable, flexible seating, the organ was mothballed (as it would cost £15,000 to repair) and a keyboard was purchased, the hymns were replaced by a mixture of hymns and modern songs and the hymnbooks were replaced by a projector and screen. 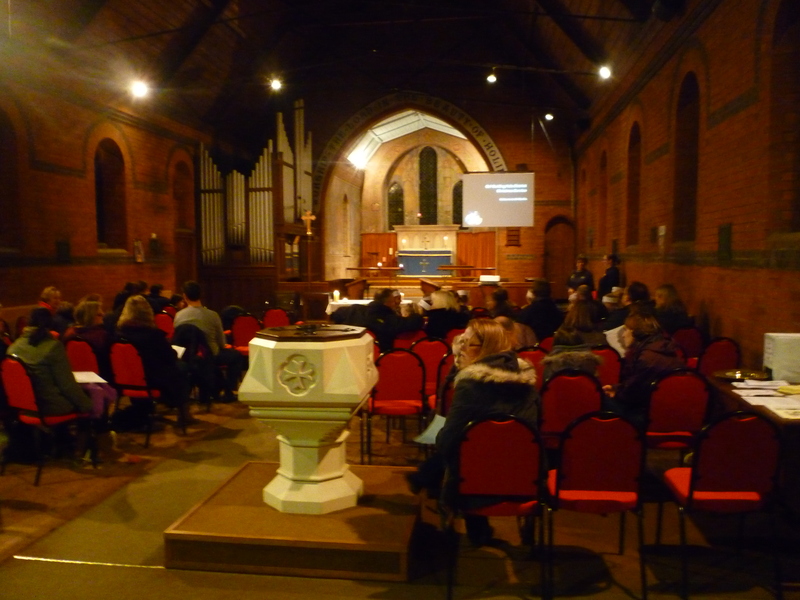 The congregation, although small, longed to serve the local community. So they worked with the Diocese and Jane Voake, our families support worker was employed to do befriending work and classes for parents with children who have ADHD. “Messy church” was started, on Thursdays after school. Inclusivity is an important feature of the St Mark’s congregation. A quarter to a third of the congregation are now children and they are full members of the congregation – they never go out to do something different to the adults – they serve, they sort the Powerpoint, they take the collection, they read, they help with the intercessions, they aren’t talked down to in a special all-age sermon. Many families, who don’t come to church on a Sunday, still see St Mark’s as their spiritual home – they appreciate the courses that Jane runs and return to see her and her team. We are working with our architect to create some spaces at the back of church for Jane and the team. We would like comfortable places with settees and movable storage units to create the sense of rooms where people can relax and chat, and also where they might like to sit and have a private conversation with Jane in comfort. Messy church has grown such that the church needs some rearranging – we have the meal at the back of the church and the worship at the front – but we have a congregation of 80 and we are finding that we are too squashed when we are having our meal. The rear of St Mark’s church is also used a great deal for other community activities – the Youth group, a younger youth group and a toddler group. These groups are growing and the church is becoming a space for the community. However, the font is a significant obstacle and a health and safety issue when children run around. Hence, we would like to reposition the font (pictured below), it is getting in the way of using the building for the community. 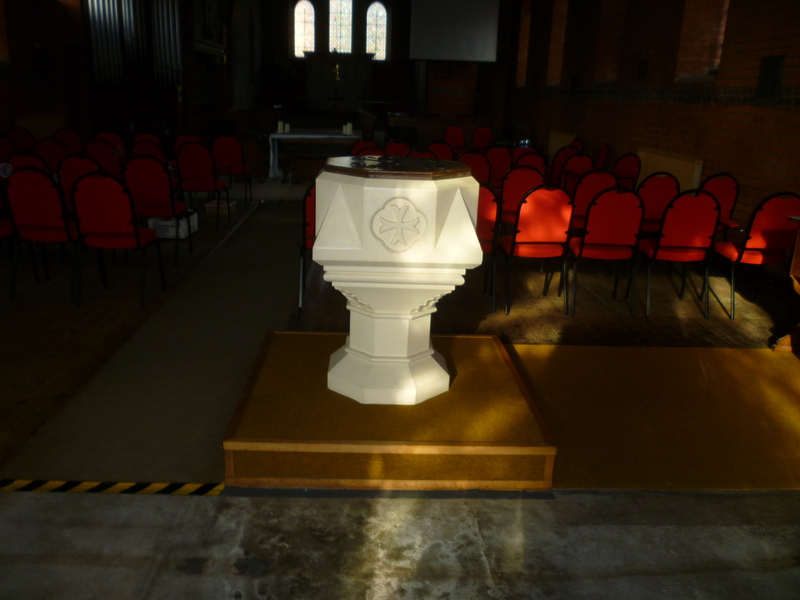 We also feel that it would be nice to have the font in view when we worship and especially would like the font at the front and up a level so everyone can easily see when people are baptised. Picture of the font which is a trip hazard for children running around. To have the font in our preferred location we need to remove the choir stalls which are just into the nave on the raised area with the organ. The choir stalls are no longer used because the style of worship is informal with a band and songs projected onto a screen. The photograph below gives a sense of the style of worship. Both St John’s Church in Hale and St George’s Church in Badshot Lea have choirs, but the style of worship St Mark’s suits those who prefer a more informal experience. The most beautiful area of the church is the chancel which has some lovely “art and crafts” style paintings and altar rail, the flower arrangements and the high altar with its altar frontals. There is a sense of peace and beauty in the chancel. Below are photos of the paintings (which we are hoping to restore). 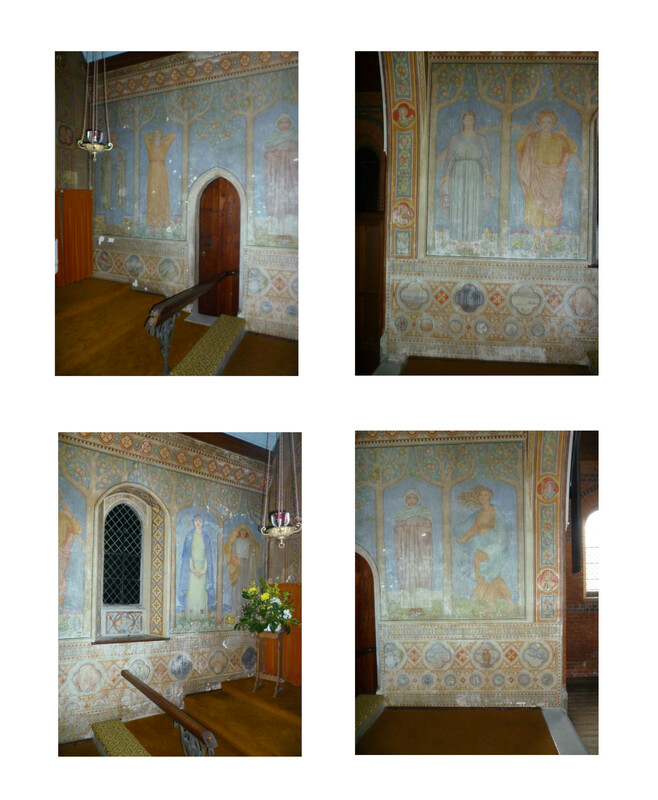 Wall paintings in the Chancel. This part of the church feels entirely cut off from the rest of the church, the choir stalls and creating an almost complete barrier between the congregation and the chancel. Even the priest doesn’t venture into the chancel area. We would like to move the font and nave altar into the area where the choir stalls currently are, then move the chairs for the congregation forward and without the barrier of the choir stalls there will be a greater sense of unity between the chancel area and the body of the church. The high altar (underneath the window at the far end of the church) has an inscription “GIVEN BI HENRIE LVNNE 1608”. However, the church was built in 1883 – 275 years later! So it is amazing to find something so ancient in the church. At the moment no-one can see the altar because it is covered by the altar frontal. But we intend to bring it forward and have the newer altar as the high altar. That way everyone will be able to see it more easily. The Organ at St Mark’s is nicknamed “Emily” and we would like to hear her being played again. Hence we will be getting some advice about how to restore her and then applying for grants to see if we can raise the money to fix her up. Hopefully, we will have a concert too, with our organists playing her to raise money. At the moment we are looking at improving the insulation, the flooring and the lighting. None of these things have been finalised yet, but I’ll blog when I know more! Can you help the congregation at St Mark’s Church, Upper Hale solve a mystery? The altar underneath the window at the far end of the church is Tudor in style and has an inscription “GIVEN BI HENRIE LVNNE 1608”. However, the church was built in 1883. So where was the altar for the first 275 years? If you would like to see the altar then the church is open on Thursdays between 10am and midday for “Drop-In Coffee” and the Sunday Service is 11am for 45minutes followed by coffee so you take a look while you drink your cuppa. Otherwise contact the Revd Lesley Crawley on 01252 820537 revdlesley@gmail.com.